Leafeon in game: 651 Who? Important notice! Pokemon Leafeon is a fictional character of humans. 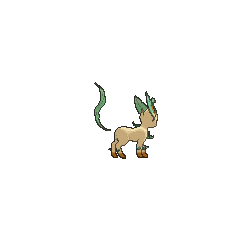 Leafeon (Japanese: ?—??? 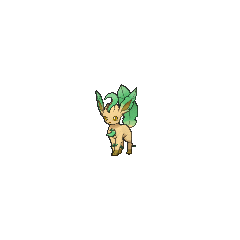 Leafia) is a Grass-type Pokémon introduced in Generation IV. Leafeon is a mammalian, quadruped Pokémon. Its body is tan with dark brown paws. It has several green sprouts growing all over it with the longest one on its head, in front of four tan tufts of fur. 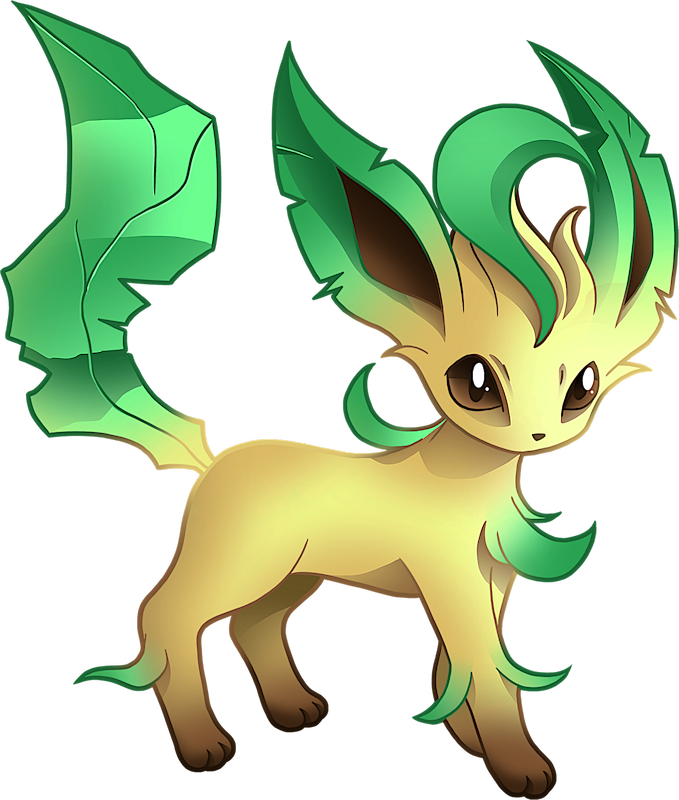 Leafeon's ears and tail have a leafy appearance. It has brown eyes and a small, brown nose. This Pokémon's cellular structure is similar to plants, which allows it to perform photosynthesis and purify the air around it by sleeping under patches of sunshine. It is a pacifistic Pokémon, preferring not to fight. Leafeon made its debut anime appearance in Double-Time Battle Training! under the ownership of Zoey. It appeared again in Coming Full-Festival Circle! in the Sinnoh Grand Festival battling against Nando's Lopunny and Kricketune. 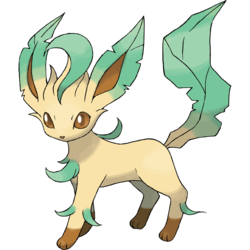 A Leafeon appeared in Team Eevee and the Pokémon Rescue Squad!, along with an Eevee and its other evolutions, under the ownership of Virgil. A Leafeon appeared in Eevee & Friends with an Eevee and its other evolutions, including the newly introduced Sylveon. Leafeon first appeared in a small cameo in the movie Giratina and the Sky Warrior. It was seen with an Eevee and the other six Eeveelutions. 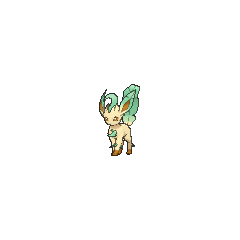 A Leafeon appeared in a fantasy in Tag Team Battle Inspiration! where Shauna imagined what Serena's Eevee could evolve into. A Leafeon appeared alongside a Glaceon in A Dancing Debut! participating in the Couriway Showcase, under the ownership of Sara Lee. DP155 Leafeon Ash's Pokédex Leafeon, the Verdant Pokémon. Leafeon is always surrounded by fresh clean air because it uses photosynthesisjust like a plant. In Volume 43, The Kimono Girls added a Leafeon to their team, completing their Eeveelution set. 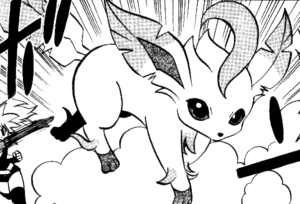 Mitsumi owns a Leafeon in Pokémon DP Adventure!. Nazuna had a Leafeon which she lent her to Lily when she had no Pokémon of her own to use for a battle. With cells similar to those of plants, it performs photosynthesis inside its body and composes pure air. She composed a racecourse and likes to let others run it. She is competing with her friends about who can compose the most interesting course. Despite Eevee being obtainable before the Pokémon League in Pokémon Black and White Versions 2, it can not evolve into Leafeon until after the Elite Four is defeated. The same applies with Glaceon. Leafeon bears many similarities to cats and foxes, such as its behaviors like tree climbing, and its cry sounds similar to a cat's meow or a foxes chirping. Its coloration appears to be inspired by the markings found on animals like the Siamese cat or the red fox. It also has traits of plants, such as the ability to utilize photosynthesis. The brown marks of its paws give the appearance that they were buried. In Japan, and around the world, there are stories about domesticated animals that upon entering the forest become wild and eventually become one with it. Leafeon could be an exaggerated example of this story. 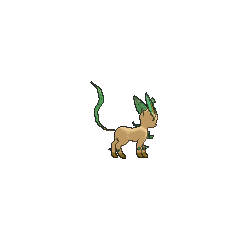 Leafeon is a combination of leaf and eon (an immeasurably long period of time, possibly referring to how long evolution takes naturally). Eon is a suffix all Eevee evolutionsshare and was Eevee's English prototype name. Cantonese Chinese ??? Yihpyibui Literally "Leaf Eevee". Ends with -?? like every Eeveelution in Cantonese. Mandarin Chinese ??? / ??? Yèjinglíng Means "Leaf spirit". Ends with -?? / -?? like every Eeveelution in Mandarin.